We believe all people need and deserve access to nature. We believe our work should span cities to wilderness. We believe that when we engage community, we create community. And we believe equity means everyone. Providing public access to Florida’s vast coastline. Residents and visitors alike are drawn to Florida’s 1,350 miles of coastline, as well as its many bays, bayous and lakes. Water is key to life in Florida, and we have been working statewide since 1974 to protect our waters and provide access to our beaches and waterways for everyone. Conserving land and building community by creating new parks close to home. As Florida’s growth continues at an astounding rate new accessible parks are needed where people live. We have completed over 400 conservation projects from urban parks, fitness zones and rail trails to working forests and wildlife areas. Adapting to Climate Change. Florida is ground zero for the effect of rising sea levels and parks are essential in responding to these impacts. We are creating resilient parks that filter stormwater, absorb storm surge, and provide a place for people to access the coastlines rather than placing people and property in harm’s way. In 2004, TPL purchased the historic Evans' Rendezvous nightclub at American Beach on Amelia Island and held it until Nassau County could acquire funds to protect it as a cultural center and historic park. In 2004, TPL conveyed the historic Broward House to the National Park System as an addition to the Timucuan Trail State and National Parks, where it will serve as a gateway to historic Fort George Island and the parks. We helped protect this historic zoo and botanical gardens in Naples, Florida. In addition to the 50 acres housing the zoo and gardens, the county protected 80 acres that will eventually be used as a "Central Park" for fast-growing Naples. TPL works to conserve land to create new parks in areas that are park deficient, expand established parks, and obtain private in-holdings in existing parks to make them whole. This 0.72-mile-long corridor, located north of Lake Highland and known as The Dinky Line, runs between the city’s downtown urban core and Loch Haven Park—home to art museums, performing arts theaters and a science center. Over the years, The Trust for Public Land has added 48,000 acres to Everglades National Park, permanently safeguarding critical habitat area from development. The Trust for Public Land purchased this park land for downtown Tampa in 1999, the first site acquired as part of the city's plan to integrate its waterfront parks into a connected system. This is the first of five new parks intended to compensate communities for the Deepwater Horizon oil spill’s economic and environmental effects. Keewaydin Island is one of southwest Florida's largest unbridged barrier islands, popular for its pristine beaches and excellent fishing. Using funds from the Florida's Conservation and Recreation Lands (CARL) program, TPL saved this historic landmark from development as a private yacht club. The Trust for Public Land is helping the city of Orlando expand the city's well-loved Lake Enola Park. From iconic theme parks to historic homes of Florida's founding fathers, TPL works with communities to protect these extraordinary places. The Trust for Public Land purchased the remaining 18 acres of this former tropical roadside attraction in a cooperative project with Indian River Land Trust. The Trust for Public Land is partnering with the Miami-Dade Parks and Recreation Department to build new Fitness Zone® installations in West Perrine Park, Oak Grove Park, Leisure Lakes Park, and Martin Luther King Park. The Miami Greenway's 5.5 miles of parks, playgrounds and pathways, once complete, will be perfect for strolling, cycling, or taking in the rhythm of the river. In 2002, TPL purchased two vacant lots adjacent to a YWCA for the first new community designed playground, which the YWCA will maintain and operate under lease from Miami-Dade County. The Trust for Public Land is working with local nonprofits and government agencies to create parks that will transform urban Miami into a green, livable, and healthy city. In 2005, TPL purchased a two-mile corridor from CSX Transportation, Inc. that brought the Pinellas Trail into downtown St. Petersburg, creating a safe, convenient route for bicyclists and pedestrians to travel in and out of downtown. Residents of Florida's Baker County have long wanted improved access to the St. Mary's, one of Florida's cleanest rivers. So when a 1,600-acre riverfront property came on the market and was eyed by developers, Baker County asked TPL to help secure the land for a public park. In 2003, TPL helped protect nearly 3 acres of beachfront as an addition to the Stallworth Lake Preserve, a popular destination on the beaches of South Walton County. This property also serves as a buffer for the fragile coastal dune lake ecosystem. Located on Sugarloaf Key, the Sammy family's 2-acre property was home for decades to a small fishing camp and marina, and later, a filming location for the movie Miami Vice. The Battle of Thomas Creek, the southernmost battle of the Revolutionary War, took place here in what is now Jacksonville, Florida. 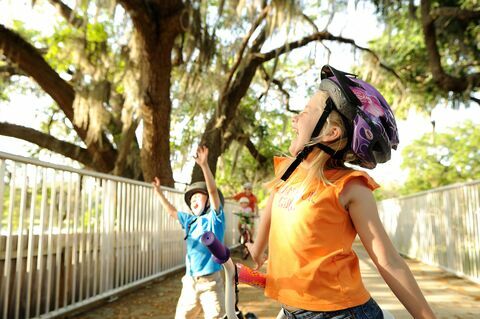 In Florida and across the country, TPL works together with CSX Railroad to turn abandoned rail beds into trails for walking, biking, skate boarding, and other outdoor activities. Florida boasts over 1,350 miles of coastline and protecting these shorelines is of the highest priority to The Trust for Public Land in Florida, and in fact, over 90% of our conservation work to date has been along our shores. Owned and managed by the City of Dunedin, Weaver Park opened to the public in 2011. TPL helped save this property, which features more than 12 acres of undeveloped coastal vista—some of the last in Dunedin—and serves one of the country's most densely populated counties. The Trust for Public Land has been working to bring Fitness Zone® installations to parks across the nation and established the first one in Miami-Dade County in July 2012.